Today’s chapter sorry it’s late I fell asleep. If possible please add this to your Novel Updates Reading List do leave a review as well. “Nope,” Ya Se shrugged. Ou Nisi Te only stood to the side with a silly smile; he had little to say and simply liked to listen. “I asked Lord Shaman to bestow you unto me,” Zou Liang replied with all seriousness. “Heng, of course he doesn’t have a say…… Ay, you dare to make fun of me!” Ao Li Quan Ya knew she had been tricked after seeing Zou Liang’s crafty look and began to chase while giving him a beating. In reality, the pair of white, tender fists felt like a massage: extremely comfortable. Ai Wei Er laughed; though Ao Li Quan Ya was likened to a clever fairy, when she came across Ya Se she could only lose. For a Bi Er to be like this was truly a mistake by the Beast God. “Lord Shaman most definitely rewarded you, is it the Medal of Honour from The Pope?” Ai Wei Er guessed. Zou Liang’s regret came from the depths of his heart. Only other men without money could empathise with this feeling. Ao Li Quan Ya and Ai Wei Er looked at each other in disbelief; sometimes, it was hard to tell whether this person in front of them was a genius or a fool. “Do you know what the Beast God’s Medal of Honour is?” Ao Li Quan Ya probed. “Who cares about what the medal is. It’s a symbol of honour; it’s not like you can use it to make a living.” Zou Liang frowned. He also had a medal of bravery 1, though thankfully the government gave a monetary reward with it. “Wo, like seeing The Pope…. Doesn’t that mean you don’t need to pay for what you eat? “Idiot! This means you have an extremely high status and they must treat you how they would treat The Pope!” Ao Li Quan Ya couldn’t hold herself back from blurting, wishing to knock Ya Se upside the head. “Hehe, it is said that this medal is something that The Pope has blessed himself and contains the highest level war song. Though the specifics are unknown, it is far more dependable than any amount of money; it seems that Lord Shaman has used the ‘loosen the reins to grasp a better hold’ approach with you.” Ai Wei Er smiled. Even though Ai Wei Er did not know exactly what had happened, it seemed that Ya Se had rejected a reward. The Shaman could not afford to show any kind of expression or else it would cool the hearts of tens of thousand of Priests; to show this level of generosity was a bit unexpected. This was an admiration from the depths of her heart, causing Zou Liang to nod his head. Conversing with Ai Wei Er was indeed comfortable, but the two’s demonstration of like-minds terribly angered Ao Li Quan Ya. But this little beauty had become craftier and did not show any expression; instead, she kept it bottled up for when an opportune moment would present itself. An Engraving Priest in Ye Lu Samo Temple had invented a completely new engraving method, one which could increase the lower range of Beast Power by one: this was a matter that would shake the entire Meng Jia Empire! With a full set, that would add up to ten points in total2! This was a massive difference, and even the slightest difference would lead to a huge variance; people had put their lives on the line for a only single point, but now there was a Spirit Engraving Method that did not leave things up to fate. Of course, currently only the shield design had been researched but this already foreshadowed the future possibilities. The hardest step to take was always the first one; the future designs would inevitably appear one by one. His Majesty The Pope was extremely pleased. The temple that could only follow the old books had returned a strong counterattack sufficient to give the Spirit Engraving Masters Guild a hard time for a while. Ya Se’s existence had also entered The Pope’s vision for the first time 3 as a distinguishably talented Bi Er that Sibalu had generously praised on top of that. Not only did he have talent, but most importantly he was incomparably sincere towards the Beast God and The Pope. He had selflessly contributed the method and—not only that—he even held resentment for the Spirit Engraving Masters Guild; even these small details were recorded. Not to mention Sibalu, even The Pope did not believe it was worthy of a Beast God’s Medal of Honour since this medal was typically given to gold-grade generals with outstanding military feats, but The Pope did understand Tuo Ma Si’s intent. If they did not please this outstanding youth enough, it would give the Spirit Engraving Masters Guild a huge opportunity. This was the fifteenth Beast God’s Medal of Honour that Pope Ben Du Ma (Běn Dǔ Mǎ) had awarded, but in all of the history of the Beast God religion, to award a Priest in training with this was simply unprecedented. In Ye Lu Samo Temple, Tuo Ma Si personally adorned Ya Se with his medal. Honestly speaking, Tuo Ma Si himself was a little envious, but his thankfulness outweighed his envy. The temple had stirred and the state of the Spirit Engraving Masters Guild was not far from an earthquake. Fortunately, this kind of method was not popular and neither was the success rate very high, else the Spirit Engraving Masters Guild would have had to close down their business. Being the chairman of the Ye Lu Samo Branch of the Spirit Engraving Guild, Sa Mu Andun was in trouble; he did not imagine that such misfortune would happen in his territory. A lot of news and rumors spread but Sa Mu Andun was clear on the main point: a priest in training called ‘Ya Se’ was the cause. Sa Mu Andun had spewed up a mouthful of blood after he heard from the reports that this Ya Se Bi Er had originally wished to enter his Spirit Engraving Masters Guild only to be chased away by his underlings. He heard that they had even insulted this prodigy, that this treasure that could have originally raised him to another pedestal had been chased away to the competition, and it had caused Sa Mu Andun so much anger that he had no appetite to speak of. People say that Bi Er are dumb, but he was truly the stupid one here. He had even let this kind of priceless design be snatched away by that old fox4 Tuo Ma Si and had turned it into the glory of the Ye Lu Samo Temple. It was utterly shameless. Anger had a time where it was appropriate, and even after he calmed down he would still have to face this problem. To poach this person… no, it should be said instead that the Engraving Masters Guild was the only place that could provide this person a place to grow. There was no one in this world that could refuse the temptation of the four cardinal vices5, much less a rash Bi Er known for their foolish naivete. 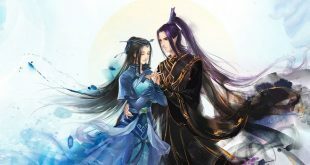 At the same moment in time in another place, the “naive” Ya Se was wearing a halo while listening to Ao Li Quan Ya hold her concert… well, technically teaching him war songs. Zou Liang intentionally did not understand, and since he didn’t “understand”, this allowed Ao Li Quan Ya to display her abilities. To listen to a beautiful princess like one from the fairy tales give a solo concert was a very blessed occasion. ”Have you heard enough to understand?” Even though she had unequaled confidence in her war song abilities, a disciple who was too dumb would still anger their master to death. When Ao Li Quan Ya was playing the part of a teacher she was very focused. This allowed Zou Liang—who was admiring the beautiful girl with her chin propped on her hands—to experience another type of atmosphere. ”Ah, okay, I don’t want others to touch you,” Zou Liang revealed what was in his subconscious. ”Pervert, what are you think about! Are you looking to be hit?” Ao Li Quan Ya could not stand this baddy. Though Ai Wei Er treated herself like air, she would sometimes let out provocative words that made Ao Li Quan Ya a bit muddle-headed and confused.